Animals with broken limbs typically display obvious signs of discomfort (crying, inappetence, aggressive behavior, etc.). These signs of pain are appreciated by most owners. 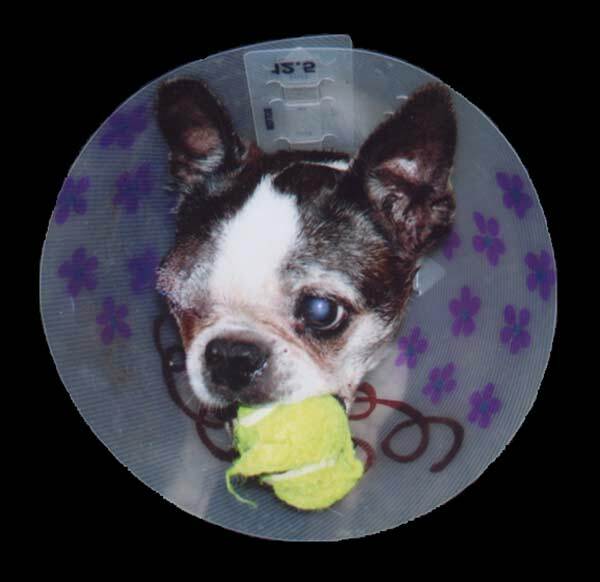 However, most owners do not see the signs of pain in their pets afflicted with chronically enlarged glaucomatous eyes. Glaucoma is actually painful. In humans elevated ocular pressures can lead to pain responses typically described as headaches emanating from indiscriminate locations. Pain from the peripheral body (surface of the skin, hands, and feet) is transmitted by A delta fibers or C fiber nociceptors to the brain. The A delta fibers are myelinated and respond to changes in both temperature and pressure with what is frequently described as bright and/or sharp pain (an acute or primary pain). For example, A delta fibers conduct pain to the brain when stepping on a sharp object causing a quick retraction from the object. Non-specific pain (secondary pain) is often described as slow-burning and is conducted from organs, or damaged nerve fibers, by C fiber nociceptors. These are non-myelinated slow moving fibers found throughout the body (skin, bone, joints, internal organs, eyes, etc.) with the exception of the central nervous system. As an example, C fiber nociceptor mediated residual pain emanates from an area of tissue damage following a penetrating injury. This type of pain is associated with longer behavioral changes including inappetence, insomnia, and aggression. The non-specific location of pain elicited by C fiber nociceptors can be confusing to a clinician. For example, pain radiating from the chest of a heart attack victim seems appropriate, but many people also report abdominal, back, neck, or even jaw pain. The death of myocardial cells in these patients is transmitted to the brain via C fiber nociceptors without reference to anatomic locations within the body. Pain associated with glaucoma is due to expansion of the globe and is also transmitted to the central nervous system through C fiber nociceptors. As ocular pressure rises, the nociceptors primarily in the sclera, cornea, and uvea begin to fire. Pain initially increases rapidly as the eye expands and then typically subsides. However, chronic C fiber nociceptor mediated pain will be continuously generated without reference to anatomic locale. A glaucomatous canine or feline cannot localize its pain to an eye and therefore blinking, squinting, or rubbing of the affected eye is uncommon. Typical signs of chronic glaucomatous pain are subsequently more subtle. Canine and feline patients may sleep more, play less, and eat less. They are often described by their owners as having aged dramatically in terms of their behavior (acting old beyond their years). As an ophthalmologist, my impression of these glaucomatous animals is that they are in chronic discomfort. Enucleations (Figure 1), and other surgeries designed to alleviate glaucoma, can often reverse this false aging process, as owners report that their pets have reverted to their younger (and happier) behaviors. Medications that alleviate pain are useful in treating animals with glaucoma. However, ameliorating the chronic pain of glaucoma can be difficult requiring multiple medications over a pet’s lifetime. Initially medications are prescribed to reduce intraocular pressure. Chronic glaucomatous pain is then treated with lifelong medications (non-steroidals, anti-depressants, anticonvulsants, and/or opioids) and/or alternative therapies (acupuncture, electrical nerve stimulation). Compliance with complicated lifelong drug regimens is problematic and side effects are common. Permanent removal of uveal C fiber nociceptors during enucleations or prosthetic implantations are also useful in eliminating chronic glaucomatous pain. If you have further questions about the treatment of glaucomatous pain, please feel free to consult with a veterinary ophthalmologist.